Each day we are faced with continuing claims made by media pundits, politicians, teachers, and friends, often quoting research. Consider also the numerous comments and posts on Internet blogs, Twitter, and Facebook that illustrate the confusion between opinion and factual data. How do we learn to interpret the research we hear about and read, to distinguish opinions from scientific facts, and to use this knowledge to conduct our own studies to answer the questions faced in everyday situations? Understanding the components that go into scientific research and learning how to do research, make decisions about which statistics to use, and analyze statistical findings are goals for everyone in today's research-oriented world. Questions about the reliability and validity of data from a study or public opinion poll come up routinely and need critical review. This book contributes to achieving these objectives. Doing Survey Research is intended for people who want to learn how to conduct quantitative studies for a project in an undergraduate course, a graduate-level thesis, or a survey that an employer may want completed. 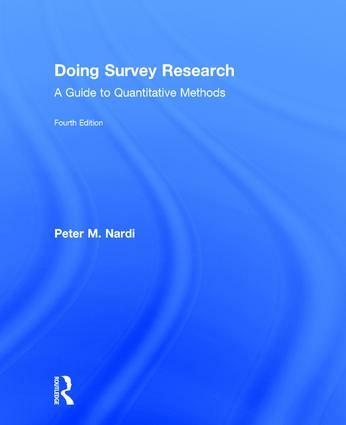 This brief, practical textbook prepares beginners to conduct their own survey research and write up the results, as well as read and interpret other people's research. It combines survey design with data analysis and interpretation. And it is for those who need to understand and critically interpret survey research found in scholarly journals, reports distributed in the workplace, and social scientific findings presented online in the media, on a blog, or in social media postings. Essential new updates to this edition include coverage of Big Data, Meta-Analysis, and A/B testing methodology—methods used by scholars as well as businesses like Netflix and Amazon. Each chapter and its exercises feature updated data and illustrations from current academic and popular articles relevant to today’s web-oriented students, including studies focused on topics related to social media. New Coverage of Big Data (used by popular web sites like Amazon and Netflix) and the ethical issues which emerge not only about privacy, but also how it relates to the methods discussed in this book about sampling, probability, and research design. New coverage of meta-data, and the increasingly popular method in many professional and other settings. Peter M. Nardi is Professor Emeritus of Sociology at Pitzer College, a member of the Claremont Colleges, former President of the Pacific Sociological Association, and author of Critical Thinking: Tools for Evaluating Research.